The Government Pension Offset (GPO). Note that neither of these rules applies in the case of a worker who receives a pension from work that was subject to Social Security taxes. The Windfall Elimination Provision reduces any Social Security benefit you would receive for other work that you did — that is, work that was covered by Social Security taxes. Example: Elena works for 21 years as a police officer — a job in which she does not pay Social Security taxes. She then works for another 19 years for a private security firm. Because of her work for the local government, Elena qualifies for a pension. And because of her work for the security firm, she also qualifies for Social Security. The Windfall Elimination Provision will reduce the amount of Social Security benefits that Elena receives. The Windfall Elimination Provision works by changing the formula used to calculate the amount of benefits you would receive if you claimed at your “full retirement age.” From there, any percentage adjustments are applied as normal for claiming earlier or later than full retirement age. 15% of AIME beyond $4,624. If you have 20 or fewer years with substantial earnings, the figure used will be 40% instead of 90%. For each year of substantial earnings beyond 20, the figure increases by 5%. Once you reach 30 years of substantial earnings, the Windfall Elimination Provision will not apply. Example: Bob worked for many years in an administrative role for his local fire department. Upon his retirement at age 67, Bob gets a monthly pension of $2,100 per month. At full retirement age, Bob’s wife Janice begins claiming her Social Security benefit of $2,000 per month. Ordinarily, this would mean that Bob could get a spousal Social Security benefit of $1,000 per month (50% of Janice’s $2,000) as long as he claims it at full retirement age or later. However, because of the Government Pension Offset, Bob’s monthly spousal benefit will be reduced by $1,400 (2/3 of his $2,100 monthly pension), thereby eliminating it completely. Upon Janice’s death, Bob will be able to claim a Social Security survivor benefit on Janice’s record. Ordinarily, since Janice claimed her benefit at her full retirement age and because Bob is claiming the survivor benefit after full retirement age, he’d be able to receive a survivor benefit equal to the $2,000 per month benefit she was receiving. But the GPO will reduce the benefit by $1,400 (2/3 of his $2,100 monthly pension), thereby leaving him with a monthly survivor benefit of $600. I’m working on a portfolio makeover, and I started a Bogleheads discussion with several questions about my portfolio. Many of the answers I received were of the same nature. Honest truth, I found it frustrating. I don’t know a lot about investing, and I just wanted somebody to tell me what to do. If you have a portfolio that you know is a mess for some reason (high costs, lack of diversification, obviously-improper asset allocation, etc. ), it’s better to go ahead and move to something that you know is at least a good portfolio, rather than spend years in search of the perfect portfolio before making any changes. The idea that you need to develop the perfect portfolio before taking action can be quite problematic. It can keep investors from breaking free of an advisor who they know is ripping them off. Even the idea that it’s possible to have a perfect portfolio is problematic. It can make people want to change their portfolios all the time based on the most recent convincing-sounding argument they’ve read. (I know this personally, because I used to struggle with it myself.) And it can keep people from focusing on other things — such as savings rate or retirement age — that are generally more important than asset allocation. Work out a “good enough” portfolio. Recognize that it will not be perfect and that there will always be well-reasoned portfolios/strategies that have outperformed you over any particular period you choose to examine. Implement the portfolio anyway and move on with your life. What Makes a “Good Enough” Portfolio? It should have low costs. Will I Get My Social Security Taxes Back? “After reading about the new online Social Security statements, my husband and I created accounts to check our estimated benefits. The website told me that at this time I do not have enough credits to qualify for retirement benefits. This is not a surprise because I spent many years out of the workforce while raising our children. The short version is that you don’t have a Social Security account — at least, not in the sense that you have an account at a bank or brokerage firm. When you pay Social Security taxes, the money does not go into an account somewhere with your name on it. Instead, the money is primarily used to pay for the benefits of people who are currently retired and collecting Social Security. In other words, when the Social Security website shows you the amount of Social Security taxes that you’ve paid over the course of your career, it does not mean that that money is sitting around waiting for you. That money has (mostly) already been spent on other people’s benefits. With Social Security, there’s no promise that you’ll get your money back or that you’ll earn a certain rate of return on your money. The promise is simply that (if the rules don’t change and the money is available to pay the promised benefits*), once you become eligible, you will receive benefits for the rest of your life (or until you become ineligible) in keeping with the applicable benefits formula(s). It’s simply the nature of the system that different people will earn very different rates of return on the money they pay into Social Security. Example 1: Susan has a very lucrative career as a physicist, earning the maximum amount subject to Social Security taxes every year from age 25-60. At age 61, she dies suddenly, with no spouse or dependents and having never been disabled. Result: Susan paid a heck of a lot of money into the system and never got back a dime. Example 2: Sharon spends her entire career working as a kindergarden teacher at a financially-struggling private school. She enjoys her work, but earns very modest pay throughout her career. At age 60, she marries Luis, a lawyer with a very high earnings history. One year later, Luis dies. Sharon lives to be 103, collecting survivor benefits based on Luis’ earnings history for more than 40 years. Result: Sharon made out like a bandit, collecting a relatively high Social Security benefit for many years, despite having paid relatively little into the system herself. The takeaway: The amount of money you end up getting back from Social Security is not directly proportional to the amount of money you put into it. The “total taxes paid” figure on the Social Security website may be interesting, but it doesn’t mean much when it comes to predicting the amount of money you’ll receive. *Admittedly, this is something of a contradiction in terms. If the rules don’t change, the money won’t be there to pay 100% of the benefits promised by the current system. According to the most recent Social Security Trustees Report, starting in 2033 only 75% of projected benefits are expected to be able to be paid unless some sort of legislative action is taken. Do Mutual Funds Have Hidden Costs? I recently read an article from Brightscope explaining that mutual funds incur costs in addition to their reported expense ratios. If that’s true, might it actually be less expensive to use a money manager to buy stocks for me rather than use a mutual fund to do the same? The BrightScope article is correct that, as a result of turnover within a mutual fund’s portfolio, the fund will incur costs (e.g., brokerage commissions and bid/ask spreads) that are not reported in the fund’s published expense ratio. Fortunately, with most index funds and ETFs (especially broadly diversified “total market” -type funds), portfolio turnover tends to be quite low. As a result, the fund’s transaction costs tend to be quite low as well. For example, the following chart (from Morningstar) shows the 10-year performance of Vanguard’s S&P 500 index fund (in blue) as compared to the performance of the S&P 500 index itself (in orange), which incurs neither expense ratio costs nor transaction costs. As you can see, the two are almost indistinguishable. The costs of portfolio turnover are there, but for an index fund with very low turnover, they’re not usually a cause for concern. But, once again, such costs are minimized by using index funds and passively managed ETFs. And the reason is exactly the same as above: Passively managed funds generally have low portfolio turnover, thereby reducing the amount of capital gains realized within the fund in any given year. To get an estimate of the tax-related costs incurred by an investor who holds a fund in a taxable account, I usually turn to Morningstar’s “tax cost ratio,” which is available by looking up a fund on Morningstar.com, and clicking the “tax” tab. It’s important to note, however, that the tax cost ratio assumes the investor is in the highest tax bracket at all times, so in many cases an investor’s actual tax costs would be lower than the reported figure. Would It Be Less Expensive to Use an Advisor? It’s very unlikely that using a financial advisor/money manager would result in lower total costs than a do-it-yourself approach with low-cost index funds or ETFs. In the first place, most advisors use mutual funds themselves, so their costs are usually in addition to the costs of the funds. And as far as advisors who use individual stocks, the vast majority are the type I’d stay far away from (i.e., the type who make dubious assertions about beating the market using superior stock selection skills). I’d be very surprised to hear of any advisors who implement passive investment strategies using individual stocks, whose total cost would be less than that of a low-cost index fund portfolio. Generally speaking, the reasons to use an advisor are that you don’t want to be bothered to manage your portfolio, or you don’t feel qualified to do so without assistance. A desire to save on costs generally would not lead to the use of an advisor. Do 401k and IRA Contributions Reduce My Social Security Benefits? “I’m in a high tax bracket, so I’ve been making pre-tax contributions to my 401k. But it now occurs to me that if doing so reduces the amount of earnings reported to Social Security, then it will eventually reduce my Social Security benefit in retirement as well, correct? If so, wouldn’t that be one reason in favor of using Roth contributions instead? And shouldn’t this be a part of the ‘Roth or traditional IRA’ question that gets so much discussion? If you worked as an employee, the figure that should show up for a given year’s earnings record on the Social Security website is the number from box 3 (“Social Security wages”) from your Form W-2 for the year. If you had multiple jobs, it should be the total of all your box 3’s. The reason they don’t use box 1 is that the calculation for box 1 includes reductions for things like pre-tax 401(k) contributions, which reduce income taxes but not Social Security taxes. If you were self-employed, the figure that should appear on your Social Security earnings record is line 4 (“net earnings from self-employment”) from Schedule SE. Note that this amount is not the same as the profit from your business. Rather, it’s 92.35% of the profit from your business, to account for the deduction you get for one-half of your self-employment tax. What Effect Do IRA and 401(k) Contributions Have? As mentioned above, pre-tax contributions that you make to an employer-sponsored retirement plan such as a 401(k) reduce your income tax, but they do not reduce your Social Security tax. The same goes for traditional IRA contributions, as well as contributions to a SEP or SIMPLE IRA. And because they have no effect on the amount of your income that’s subject to Social Security taxes, pre-tax contributions to an IRA, 401(k), 403(b), etc. 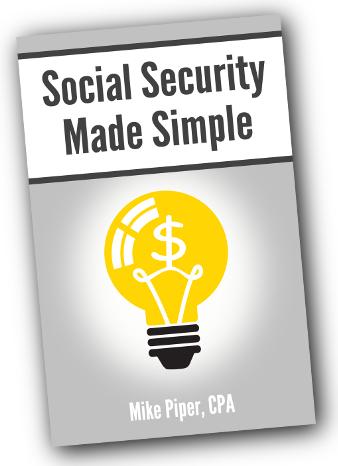 do not reduce the Social Security benefits that you will eventually receive. The Social Security Administration used to send a statement each year that included your earnings record by year, as well as an estimate of what your Social Security retirement benefit would be if you claimed it at age 62, at full retirement age, or at age 70. Then, in 2011, the SSA stopped sending those statements in an attempt to save on costs. At the beginning of this month, however, the SSA announced that you can now get your statement online at SSA.gov/mystatement (after jumping through some hoops to verify your identity, that is). Even if you’re a long way from retirement and are not currently concerned about getting an estimate of your Social Security retirement benefits, I’d encourage you to go ahead and create an account for the purpose of checking your earnings record. Mistakes happen, and it’s best to get them fixed as quickly as possible. Please note, however, that according to the SSA, if your record is missing earnings from this year or last year, it’s not necessarily a problem. Most likely, it simply means that the earnings haven’t been recorded just yet. They should appear on a later statement. If you were self-employed, Schedule C or Schedule SE from that year. Once you’ve found something documenting your earnings, you’ll want to call the SSA to get things straightened out as soon as possible. If you no longer have anything documenting your earnings for the year in question, you could call your employer from that year to see if they’ll send you your W-2 or, failing that, some other sort of payroll record.